The 3B’s has for what seems squillions of years held their rather excellent rally at possible the quirkiest venue of Hotel with 3 distinct camping areas in Hampshire. Sadly the loss of this venue meant they needed to find somewhere new. Thankfully after looking around they found an equally unusual venue, a garden centre in Berkshire. The venue, “roots garden centre” also gave the event a great name of “New Roots” all I had to do is get over my fear of Berkshire. In all my journeys I have never known why Berkshire exists apart from I am sure to confuse the heck out of a Bosun. It may be a new venue, but it was the same 3B’s welcome and selection of interesting bikes in their show. There was also the usual fine selection of retail emporiums and a very nice Thai food van. The bar was located in a semi completed building where also the stage was set up. Despite the low ceilings, “mind that mandolin Stevie” it was a great set up allowing revellers to escape the midday sun. I haven’t heard Stevie play for a while now and really enjoyed his newer material; sadly I had to avoid the temptation of the real ales. I think the beers though persuaded many of the 3B’s onto the bucking bronco, not many got the hang of it. 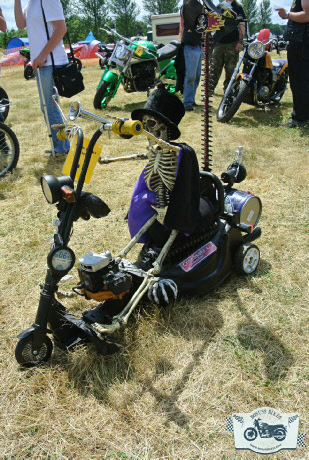 One of the fun things about rallies like the 3B’s is the quirkiness and inventiveness of entries from a Chopper bicycle to a skeleton on mini trike type thing. Being useless at this type of thing I have no idea who won though. Bikes of note to me were the blue and white chop (I could enjoy that) the tiny chrome tanked Harley and the very nice tribute bike. There is already talk of the rally returning to this venue next year, seems they are now taking root. A great event even if in Berkshires I eventually escaped the counties clutches by heading was out west and doubling back, well it was sunny.